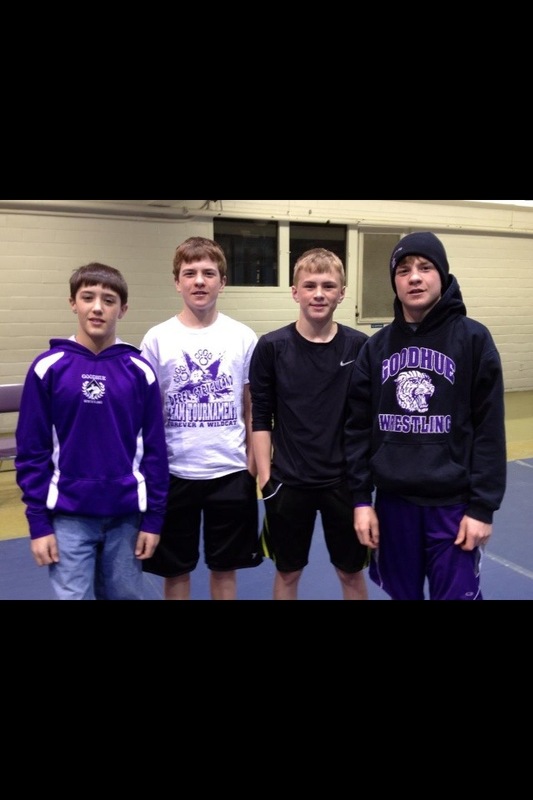 Spring wrestling practice at Goodhue for Monday, April 22 is canceled. The next practice available will be Wednesday, April 24th at 7:00 p.m. This evening, the Goodhue Elementary program competed in their second state NYWA tournament at the Mayo Civic Center in Rochester. In the opening round, Goodhue moved past Sauk Rapids 41-29. The semi-finals saw the team lose to Minneota in a close dual. But with a rally on the top weights, Goodhue finished the bracket with a 3rd place finish after a 39-30 win over Big Lake! 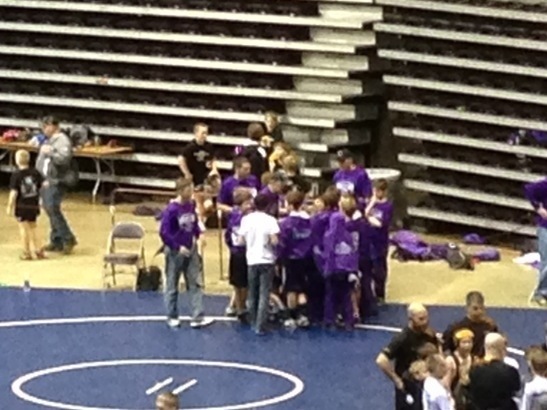 On Sunday afternoon the team closes out the state tourney and the season with two duals. The Parade of Champions begins at 12:00, and the first whistle blows at 12:30 p.m. The Goodhue team will start its action with first round opponent Sauk Rapids on Saturday at 4:00 p.m.
Fourth Round Update: Kaleb won, and is in Championship Finals; Kelby wrestling semifinal to determine for 3rd or 5th. Individual Final Results: Kelby O’Reilly finishes in third place, and Kaleb O’Reilly finishes as a state champion! 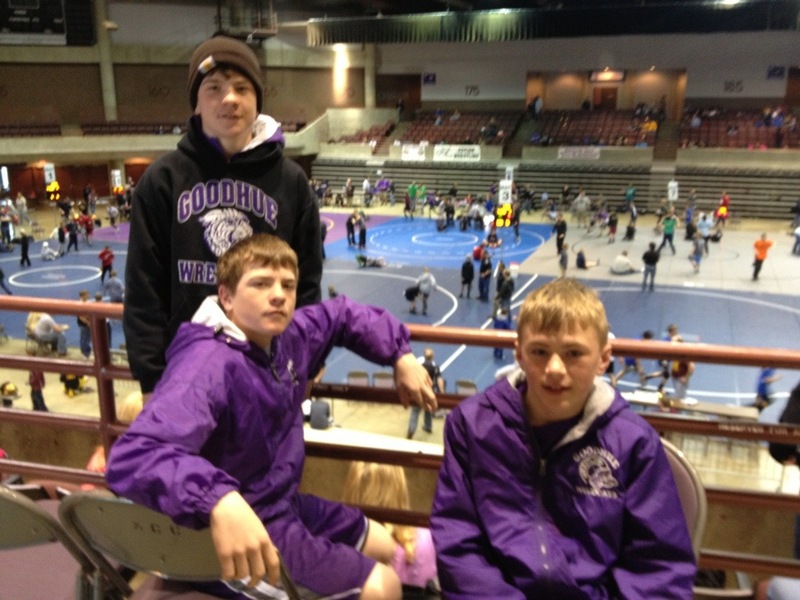 Kaleb and Kelby O’Reilly, and class mate Carter Danielson, pose for a pre-tournament picture. Thanks to all who contributed in the setup, execution and celebration of the 2012-2013 season at the wrestling banquet last night. I hope you enjoyed the evening as we looked back on the JV and Varsity team accomplishments and efforts, gave out some awards and milestone recognition, and said farewell to our four seniors. If you have any pictures from the evening and are willing to share them, I’d appreciate that. I could then make a post of the award winners with pictures for all to see.